New York City is at a pivotal point in its recycling program, and fresh initiatives, lofty goals and new personnel could finally lead to a trifecta of reduced costs, more jobs and a minimized impact on the environment. That is if all goes well - which has not always been the case with recycling in New York. The city's 8.2 million residents disgorge a daily mountain of 12,500 tons of residential trash, and the recycling rate for all that detritus is stalled at around 16 percent. This year's target bumps the residential rate up to 25 percent. And by 2015, the city aims for a 70 percent reduction in its total waste stream, residential, commercial and otherwise. The 70 percent is a stretch, but I'm optimistic: The city has appointed recycling coordinators for each of the five boroughs and has adopted a 20-year Comprehensive Solid Waste Management Plan. David Hurd, director of the newly created Office of Recycling Outreach and Education, is brimming with energy and ideas, and his staff, in the Council on the Environment for New York City, will have a close working relationship with the mayor's office. And the city recently has launched announced a pilot program for recycling in selected public places, including some parks. All this stands in contrast to the great leap backward that the city took in 2002 when it vastly scaled back its recycling program. The cutback occurred at the very time that recycling, mandatory in New York City since July 1989, had morphed into a way of life as well as a civic duty. For many of us, separating all that paper and plastic, metal and glass had become a part of household routine. 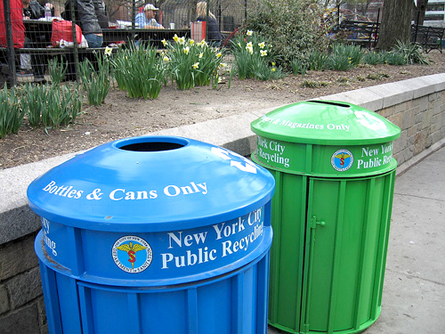 I knew that if New York backpedaled on recycling, even temporarily, we would lose momentum. And we did. Just ask someone with first-hand knowledge: "Recycling has dropped," Harry Nespoli, president of the Uniformed Sanitationmen's Association Local 831 IBT, said at a recent public forum on Community Recycling. "What we noticed is that when it first started, there was a system out there. And people adjusted to the system." And then they "de-adjusted." Who could blame them, given all the confusion: Pickups took place only every other week. For a while, the city stopped recycling plastics and glass. Then recycling of plastics resumed, but not glass. Finally recycling of plastics resumed too. "It really took the heart out of the people of New York City," Nespoli said. "We're losing on recycling." At the forum, Staten Island City Councilmember Michael E. McMahon, chairman of the Committee on Sanitation and Solid Waste Management, concurred with Nespoli's assessment: "We're kind of in a slump on recycling," McMahon said. "The numbers are down. They're not where they should be." Not only can we do better, we have to: Projections call for New York's population to swell by 1 million by 2020, to more than 9 million. So the problem of dumping recyclables can only get worse, to the detriment of the environment and our quality of life. Garbage affects the municipal pocketbook, too. Done right, recycling can be much less expensive than hauling the same stuff out as trash. Using recyclables in manufacturing is less energy-intensive than using raw materials. Less energy use translates into less production of greenhouse gases, ultimately reducing the city's contribution to global warming. Recycling also has the potential to create new jobs as industry innovates, finding novel ways to use recyclables. This is why I strongly support the 70 percent total waste diversion rate that the Solid Waste Management Plan recommends. In plain language, this means that by 2015, there would be a 70 percent reduction in the amount of garbage that the city pays to ship to landfills. Along with this, we need to make sure that the city moves ahead with its pledge to work with private firms to develop a state-of-the-art transportation and processing infrastructure that will create a trash-into-treasure partnership: Together, we must find better ways to collect recyclables and recast them as salable commodities. The city also must quickly move forward with its private partner, Sims Hugo Neu, to develop the promised recycling processing plant at the South Brooklyn Marine Terminal. The waterfront location will let the city transport more recyclables by barge, cutting down on the number of trucks that pollute city air. But for all this to work, the city will have to do a far better job of reaching out to residents to better educate them about recycling. In the late 1990s, as McMahon pointed out, such high-profile New Yorkers as the Yankees' Joe Torre made pro-recycling public service announcements. When is the last time you heard a celebrity - or anyone - make a let's-recycle pitch? We need smart, well-designed new promotions. We’re encouraged that Hurd, the new director of recycling outreach, is looking for ways to make this happen. The city also needs to follow through on its commitments to expand the types of materials it recycles, such as electronics. And the Composting Facility Siting Task Force must quickly move to identify appropriate locations and technologies to make composting a reality here. There are special challenges in New York City, given its density, diversity and sheer size, but it can no longer argue that composting is not a viable option for a big city. San Francisco composts, and so does Toronto. Toronto, in fact, thinks outside the box when it comes to recycling, to excellent effect. In 2006, the city, with a population of 2.6 million, recycled or composted about 43 percent of the waste it managed. The program is not inexpensive, Geoff Rathbone, acting general manager of Toronto's Solid Waste Management Services, told our forum. But Toronto offsets some of the costs by requiring industries whose products create the trash to share in the cost of recycling. That includes manufacturers of fast food, soft drinks, cat litter, newspapers and numerous others. Toronto also makes composting "as easy and yuck-free," as Rathbone put it, as possible. Fruit and veggie peelings, used diapers, microwave popcorn bags, chicken bones, pet waste - it all goes in the same green bin. Toronto and other cities have made great strides forward in the matter of recycling. There is no reason New York can't do the same. Or better. As the city embarks on its new 20-year plan, announced by the mayor on Sunday, residents should support it by doing their part. Recycling tips are at here. New York may be the greatest city in the world, but recycling is one all-too-obvious way in which we can make it even greater. Let's do it.